Currently a great deal of public discourse around health is on the assumed relationship between childhood inactivity, young people’s diets, and a putative steep rise in obesity. Children and young people are increasingly being identified as a population at ‘risk’ in relation to these health concerns. Such concerns are driving what might be described as new ‘health imperatives’ which prescribe the choices young people should make around lifestyle: physical activity, body regulation, dietary habits, and sedentary behaviour. These health imperatives are a powerful force driving major policy initiatives on health and education in a number of countries in the Western world. Schools in particular have been targeted for the implementation of a plethora of initiatives designed to help children and young people lose weight, become more active and change their eating patterns inside and outside school. Addressing these issues requires an innovative theoretical approach. Neither the fields of ‘eating disorders’ nor ‘obesity research’ has addressed these issues from a sociological and pedagogical perspective. The contributors to this edited collection draw on a range of social theories, including Michel Foucault and Basil Bernstein to interpret the data collected across three countries (Australia and New Zealand, United Kingdom) and from a range of primary and secondary schools. 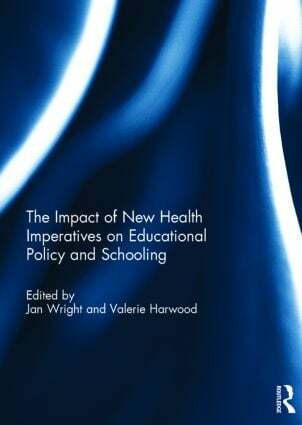 Each chapter addresses various aspects of the relationship between health imperatives as constituted in government policies, school programs and practices, their recontextualised in school practices and the impact of this on the subjectivities of children and teachers. Jan Wright is a Professorial Fellow in the Faculty of Social Sciences at the University of Wollongong, Australia, and a member of the Early Start Research Institute. Her research draws on feminist and poststructuralist theory to critically engage issues associated with the relationship between embodiment, culture and health. Her most recent work has focused on the recontextualisation of health imperatives in various pedagogical sites, including school and the media, and on the consequences of these imperatives for the subjectivities of children, young people, teachers and parents. She is co-editor of Biopolitics and the ‘obesity epidemic’: governing bodies (Routledge 2009) with Valerie Harwood, Young people, physical activity and the everyday (Routledge 2010) and co-author with Michael Gard of The ‘obesity epidemic’: science, ideology and morality (Routledge 2005). Valerie Harwood is an Associate Professor in the Faculty of Social Sciences at the University of Wollongong, Australia, and a Future Fellow with the Australian Research Council. Her research interests include the production of knowledge on child and youth psychopathology, critical disability studies, youth exclusion and practices of medicalization in schools. This work is engaged in the critical analysis of issues that impact on inclusion in education. Research projects include work with Indigenous young people and education, and the investigation of socio-economic status and place in educational disadvantages. Her most recent book, co-authored with Professor Julie Allan, is Psychopathology at School: Theorizing Mental Disorders in Education (Routledge).